The third of October, boats with white bread, herring and cheese relieved the people of Leiden. Obviously it is a lot easier to tell the thrilling story of the siege and relief of Leiden with the help of a fine map. This old fashioned school map of more than a century ago, part of a series of twelve, was at that time a very modern educational aid. This way the teacher could demonstrate how Leiden was surrounded by the Spanish army. From the red colored ‘schansen’ or fortresses, the Spaniards ensured that the town could not be provided with food or soldiers. Lacking artillery they tried to force the town to surrender by starvation. They almost succeeded. Prince William of Orange and the States of Holland used their last resort: they ordered to cut through the dykes along the great rivers, to inundate the countryside. But it took a long time before the water reached such a level that a fleet to relief the town could make its way through enemy lines. The dotted line on the map, starting in the south, shows how the fleet met heavy resistance at Zoetermeer. Using an eastern passage they reached the town via the Lammenschans, given up by the Spanish commanders because of the rising water. The third of October, boats with white bread, herring and cheese relieved the people of Leiden. When the publisher of the series decided to reprint them twenty years later, they left out the map of Leiden. Nationwide there was almost no interest for the map of Leiden and it was replaced by the map ‘Four phases in the Eighty Years War’. 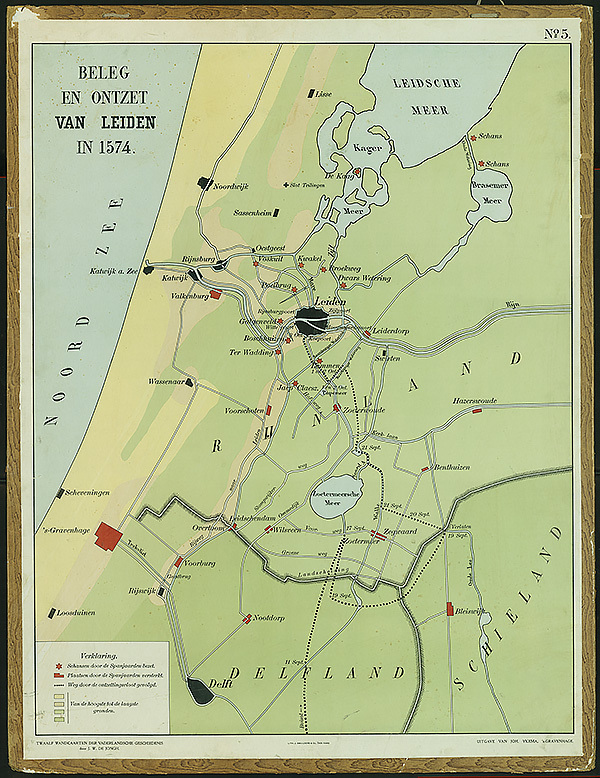 That makes the recent acquisition of this map for Leiden University Library even more precious, a gift by Mrs. Marijke Wesseling-Teppema in Oegstgeest. No Third of October Feast without its Programme!